In the Mythological Cycle of Irish Mythology the Milisians invaded Ireland after seeking a land without serpents as foretold by Moses. The Milisians would overthrow the Tuatha Dé Danann, a semi divine people whose power and magic were enhanced by their interaction with the gods. The Dé Danaan ruled over Ireland for four centuries but as with all things an end is always in sight. Far to the east on the endless steppes of Scythia, a tribe of great horse warriors began to journey south over the Caucasus mountain range and onto the plains of Mesopotamia. The tribe descended from Noah through his son Japhet and from the Lebor Gabála Érenn, (The Book of the Taking of Ireland), we learn that one of their leaders was a man called Fenius Farsaidh who helped construct the tower of Babel. Fenius Farsaidh had a son called Nel whose wife was Scota, an Egyptian princess. The son of Nel and Scota was called Goídel and it was he, who after the destruction of the great tower and the curse of the confusion of tongues gave his name to a new language known as Gaelic. When Goídel was a youngster he had been bitten in the neck by a venomous snake. The boy was dying and in their anguish Nel and Scota turned to Moses, the leader of the Israelites in Egypt. They begged the holy man to save their son which he did but the boy would forever carry a green scar and because of this he would be known as Goídel Glas. Moses also foretold that Goídel’s descendants would settle in a land that would have no serpents. For several generations the children of Goídel stayed in Egypt but when Sru became their leader he decided that it was the right time for his people to move out of the land of the pharaohs. He took them on a journey that after 400 years would lead them north back into Scythia but they eventually continued their journey westwards. They came into the island of Crete in Greece and found that it was a land free of snakes. The Gaels settled in Crete for five generations but when war came upon them they travelled west until they reached the great peninsula of Iberia. In Iberia the descendants of Goídel, during the rule of their chieftain Breogán, constructed a city on the north coast called Brigantia and it is thought by many in Spain and Ireland to be the site of modern Coruña. The Gaels built a tall tower in Brigantia and on one winter’s afternoon, when the air was sharp and clear, Ith, the eldest son of Breogán, climbed to the highest point of the tower. For his effort he was rewarded by the sight of a coast line in the distant north. He immediately told his family and they set about organising an expedition to this distant coast. The people of Gaels named the new distant land Inis Fáil (Island of Destiny) and Ith would lead an expedition to the newly discovered land. As their ships beached on the shores of the new land they were met by three men representing its inhabitants. They were Mac Cuill, Mac Cecht and Mac Gréine. These were kings of the Tuatha Dé Danaan and at first they were welcoming towards the new arrivals. Ith was amazed at the beauty of the new land and when he heard that there were no serpents on the island he was delighted. However, for some reason or other, the three kings became wary of Ith and killed him with their magic. Ith’s followers jumped back in their ship and fled back to Brigantia. 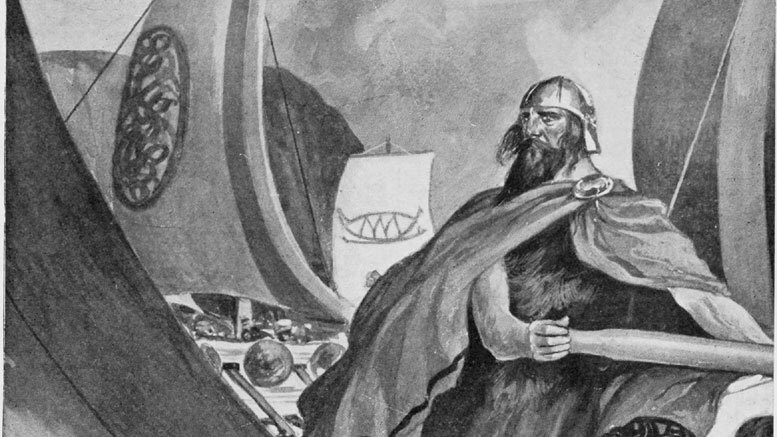 On their return to Brigantia Ith’s followers told their sad tale to Míl Espáine, the brother of Breogán and uncle of Ith, he was filled by angered and a thirst for revenge. He ordered his eight sons to go and take Inis Fáil away from the Tuatha Dé Danaan. Aware that the enemy were magicians of great power, he ordered his druid Amergin to accompany his sons. The sons of Míl led the Gael into Inis Fáil and although they met fierce resistance they were able to overcome it driving the Dé Danaan back. The Milisians next directed their advance towards the royal capital of Teamhair (Tara). As they marched over the mountains they were met by Banba, Fodhla and Éiriu the wives of the three kings responsible for the death of Ith. The women told the Gaels that if they named Inis Fáil after them they would have good fortune. The druid Amergin agrees to do so and they all travelled on to Teamhair where the Mac Cuill, Mac Cecht and Mac Gréine awaited them. After fierce fighting the Dé Danaan asked for a three day truce. They requested the Gaels to sit nine waves out from the land to which Amergin agreed. The Dé Danaan using their magic caused thick fog to cover and hide the land from the Gael in their ships. However, Amergin’s magic was much stronger and he called on the wind to increase and scatter the fog. The Dé Danaan knew that they were beaten and they fled to the underworld where they still live to this day. They are the Sidhe (Fairy Folk). The Gael were now in possession of the whole of Ireland. They divided the land between the sons of Míl Espáinne. The north was to be Eremon’s and the south would belong to Eber. The north east corner was given to the children of Ir, a brother who had fallen. The southwest corner was given to the family of It, the first of the Gael to set foot in Ireland. True to the promise of Amergin, the island would be called after Banba, Fodhla and Éiriu. This is how the Gael came into the land promised them by Moses.